These are the items that you need to get... but there is no need to pay full price, get the name brand or even buy them new. I find that most things I buy fall into this category! 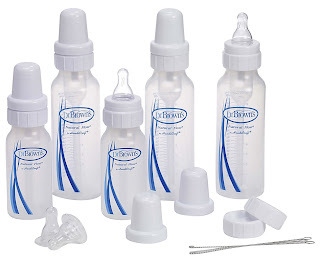 A full kit of bottles if you are planning on exclusively breast feeding. We got a full kit of Dr. Brown bottles, that Bailey won't even take. It would have been much better for us to return and/or wait to buy a full set. In the mean time borrow from friends or just purchase one bottle of different types to see what works for her. Sadly, we got this advise and did not follow it. I felt for sure I could get her to take the bottles... and she won't take any right now! 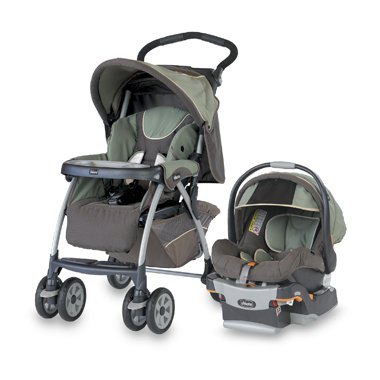 Travel system (carseat with stroller). We did tons of research on safety, and talked to friends. The safety of our child in the car is not something I am willing to compromise for a good deal. Also, while I often wear Bailey, it is convenient to have the option of leaving her in the carseat or just attach the carseat to the stroller without having to take her out. BABY CLOTHES!!! These are outgrown, spit up on, and even pooped on. There is just no need to go crazy in this category! Almost all of Bailey's clothes were given to us. We did luck out because some friends from work gave her some really cute things, but even if we didn't get those, I would shop consignment. As she outgrows the sizes we have, we plan to replace them with sale and consigned clothes. It's so true! We save and skimp so we can have the things that we truly want! So many think being frugal and cheap is a horrible thing but it's simply being wise! Absolutely wise to "skimp, splurge and save" and I'll tell you why! They only get more expensive as time goes on! I have always been a frugal shopper because I have always been a "stay at home mom" and with only ONE INCOME you have to be frugal and wise when spending!